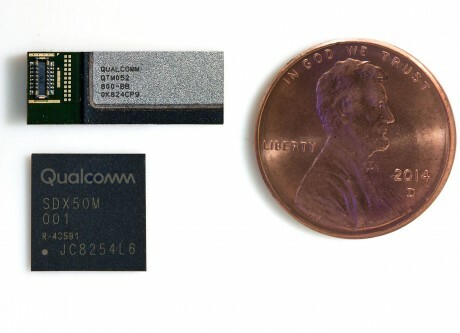 Qualcomm today announced new antennas that will bring mmWave and sub-6 GHz 5G to mobile devices such as smartphones. The QTM052 mmWave module and QPM5xx sub-6 GHz RF module are compact enough that they are suitable for phones. Qualcomm says the QTM052 mmWave module works together with the X50 to overcome some of the technical hurdles that previously kept mmWave from mobile designs, such as thermals and regulatory requirements for radiated power. The new modules support beam forming, beam steering, and beam tracking to improve the range and reliability of mmWave signals. The modules also contain the 5G NR transceiver, power management circuit, RF front-end, and phased antenna array. Qualcomm says the modules can handle up to 800 MHz of bandwidth in the 26.5-29.5 GHz, 27.5-28.35 GHz, and 37-40 GHz bands. The modules are small enough so that up to four of them can fit inside a phone, which gives phone makers more flexibility when it comes to their designs. Qualcomm expects to see phones with mmWave 5G NR reach the market during the first half of 2019. The QPM5xx sub-6 GHz RF module consists of a family of antennas that are also compatible with the Snapdragon X50 to support 5G NR in spectrum below 6 GHz. There are four modules in the QPM5xx family, all with slightly different capabilities. Each supports SRS switching and massive MIMO in the 3.3-4.2 GHz, 3.3-3.8 GHz, and 4.4-5.0 GHz bands. While mmWave spectrum will be best put to use providing coverage in dense urban areas and indoors, sub-6 GHz spectrum will be used to cover broad outdoor spaces. Both the QTM052 and QPM5xx family are sampling with customers.